Read this article to know all the details about snake boat races or vallamkali during onam festival.Onam is the most important festival for the people of Kerala state. It is a time for immense joy and togetherness between families and friends. One of the celebrations during Onam is the snake boat races. Onam is a very important festival for the people of Kerala. It is celebrated with a lot of enthusiasm by them. The festival spans for ten days, the tenth day being the most important day of the festival. Onam has many specialities and unique celebrations such as making pookalam designs, playing traditional Onam games, performing traditional Onam dances, preparing a grand banquet and conducting snake boat races. 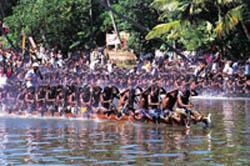 The boat races which are also called Vallamkali are now world-famous as it is unique and requires a lot of hard work and team unity. 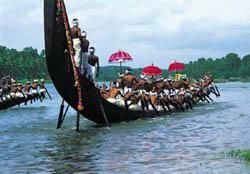 The snake boat race is organised in many parts of Kerala especially in those places where there are backwaters. The Aranmula temple in Kerala, which is built at the banks of the river Pamba, is one of the most famous places for vallamkali. 'Vallam' in Malayalam language means water and 'kali' means to play. Aries Punnamada Chundan, which has a length of 144 ft, is the longest steel snake boat in the world because of which it has entered the Guinness Book of World Records and also has a place in the Limca Book of Records. Vallamkali takes place usually on uthratadhi nakshatram of the Chingam month. The race consists of hundreds of oarsmen in one boat itself who take part very excitedly in the match. Vallamkali has also achieved a lot of importance as a tourist attraction. Many people from the nearby states and even from abroad India visit 'God's own country' to witness the unique style of racing with boats. The snake boats are known as 'chundan vallam' in Malayalam. It is a thrilling sight to watch the hundreds of oarsmen move their oars in a synchronised and swift manner to race the other boats and reach the finishing point. Nearly 30 snake boats take part in the competition with each boat carrying at least 100 oarsmen in them. It was India's former Prime Minister Pandit Jawaharlal Nehru who developed vallamkali as a national level competition after being mesmerised by the uniqueness and charm of the sport. The shape of the snake boats are also very unique with one end of the boat having a very pointed edge which faces upwards, almost like the hoods of a cobra which is why they are called as 'snake boats'. The architecture of the boats was designed by Kodupunna Venkitanarayanan Asari. Infact it is made with a completely different design structure from other normal boats. This is not a wonder as the boat ultimately has to have the capacity to hold at least 100 oarsmen in it. The boat is made up of Anjili or Kadamb wood. A lot of hard work and dedication goes into the making of the snake boats. Another interesting fact about chundan vallams are that only men are allowed to make the boat. Also, one can only enter the boat bare footed as the boat is considered very sacred by the people of Kerala. For them, snake boat races are not just a game or a competition but it has more religious importance too. The boat is also decorated at its end with a golden lace and the flag. Decorated umbrellas are also kept in few numbers inside the boat to add to the beautiful sight. The oarsmen wear dhotis during the competition. Out of the 150 men who sit inside the boat, 25 of them sing traditional Kerala songs while the rest 125 men steer the boat with their oars. Synchronisation and harmony among the oarsmen is very essential as even if one of them make an error in moving the oars, it can create a huge imbalance which could even make the boat overturn. The boats are also annually checked for any repairs or amendments. There is a small interesting story also that lies behind the initiation of snake boat races. It is believed that many years ago, a noble Brahmin man called Katoor Mana used to visit the Aranmula temple and Pamba river for worship daily. On one such day after he finished offering his prayers, he wished to find a poor person so that he could do a noble cause of feeding the person. But even after a long wait he did not see anyone nearby. So ultimately he closed his eyes again and offered his prayers to Lord Krishna. After this when Katoor Mana reopened his eyes, he saw a poor boy standing right in front of him. This made him very happy and he fulfilled his wish of offering some food to the poor boy. The amazing fact is that the boy disappeared soon after he finished eating the meal. Katoor Mana wished to search for the boy in the surroundings. He kept sighting the boy around the temple many times but the boy disappeared very soon after that. This made Katoor Mana faith's in god all the more strong as he believed that it was the lord himself who made an appearance before him. Thus, Katoor Mana decided to offer food to Aranmula temple each and every year during the Onam festival. But he had to make sure that the food was protected from the pirates who used to make their journeys in the Pamba river. For this purpose, he used to request the people who owned the snake boats to give him company till the temple. As Katoor Mana was doing a very noble job, many of the snake boats voluntarily came forward to help him in his cause and protected the food during the journey to the temple. This was the beginning of how the snake boat races started. This incident led to many other developments which ultimately brought the snake boat races to such a national level. Read this article to know more about chundan vallams or snake boats, which are an important part of snake boat races associated with Onam festivals. Here you will get some information regarding some of the famous chundan vallams, aries chundan, history & legend behind the snake boats, building of a snake boat etc. The above was a good update for me.